Manchester United manager Jose Mourinho went through his full range of brave faces as he looked at Manchester City disappearing into the distance at Old Trafford. City's 2-1 win in the derby on Sunday, more convincing than that scoreline suggests, means they are now 11 points clear at the top of the Premier League after ending United and Mourinho's 40-game unbeaten run at home. Mourinho, understandably, said United would continue to fight for every point in the battle to peg City back - but the body language of everyone inside the 'Theatre Of Dreams' at the final whistle suggested something else. So has City manager Pep Guardiola finally won the battle for supremacy in Manchester with his old adversary from their La Liga days at Barcelona and Real Madrid? Listen: Is the Premier League title race over? Mourinho will have known the huge significance of this Manchester derby - and all the old tricks were on display to at least keep their rivals in sight, even at this early stage of the season. It was the suggestion that City's players go to ground too easily: "A little bit of wind and they fall." It was the suggestion they practise dark arts as he talked of City committing "tactical fouls". And there was even the questioning of Guardiola wearing a yellow ribbon in support of those fighting for independence in his native Catalonia. Mourinho's mischief, particularly from a manager more than happy to trade on gamesmanship in the past himself, did not put any doubts in the mind of referee Michael Oliver. Indeed, it was Mourinho himself who was left bemoaning a decision when United midfielder Ander Herrera fell under challenge from City defender Nicolas Otamendi in front of the Stretford End in the second half and Oliver was unmoved. 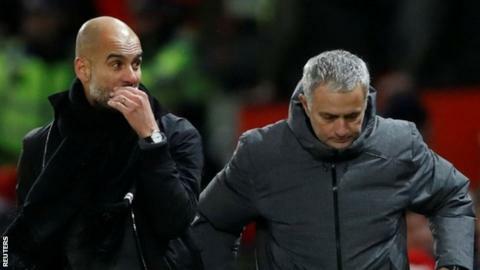 It was City who last inflicted defeat on Mourinho at Old Trafford in September 2016 and the Portuguese drew the comparison as he suffered the pain of that non-decision. "It is like last season. Exactly the same, you can speak about anything you want, you can bring any football theory, you can bring the stats, the ball possession, you can bring everything you want - but like last season it is a huge penalty in a crucial moment of the game," he said. "But I have also to say that I feel sorry for Michael Oliver because I think he had a good game, I would say very good game, assistants the same. I think they come with the intention to make the perfect work, which they almost did." It was City who showed the calm defence, decision-making and street wisdom that Mourinho likes in his own teams, running down the clock in a scrappy final period, unusually helped by Bernardo Silva's uncanny ability to win throw-ins off United players. On and off the pitch Guardiola was the winner and for all Mourinho tried to unsettle Manchester City and set the match's agenda, he and United came up against opponents who were simply too good. Has Guardiola's purist approach overtaken Mourinho's caution? Guardiola said before the game he would "rather retire" than depart from his beliefs - and Manchester City's supporters were only too happy to revel in their team's purist approach. The chant of "Park The Bus, Park The Bus, Man United" provided a constant musical backdrop as City penned back surprisingly subdued opponents - a jibe aimed as much in Mourinho's direction as those on the Stretford End. And there was no doubt United's cautious approach paled in comparison to the smooth, flowing attacks of Manchester City. Guardiola's City looked ultra-modern, while on this occasion Mourinho's United looked dated. United posted a 35% possession rate, their lowest at Old Trafford in the Premier League since 2003-04 - when data was first collected. The home fans were steadfast in their support but even they voiced demands for a more positive approach with chants of "Attack, Attack, Attack" as City were sharper to the ball, more assured in possession and more dangerous. One of the reasons behind this was the absence of United's prime midfield force - the suspended Paul Pogba - but City looked in the mood to cope with any obstacle Mourinho could put in front of them. Since taking over at United and City at the start of last season, both Mourinho and Guardiola have overseen 54 Premier League games. Guardiola has a 70.4% win ratio, while Mourinho's stands at 53.7%. It may seem a harsh verdict as United have fallen behind a team on a historic Premier League run of 14 successive wins but the clash - or rather the crash - of styles was one in which City looked more fit for purpose on this occasion. The current evidence does indeed suggest Guardiola is winning the head-to-head and it takes a huge leap of the imagination to see how he will not bring the Premier League title back to Manchester City in his second full season at the club. This, should it come to pass, will cause pain to Mourinho because he is a man on a mission to show his best work at Manchester United after his sacking at Chelsea just months after winning his third title at the club, claimed after returning for a second spell. It should, however, be stressed that since Mourinho and Guardiola returned to face off in Manchester, the 'Special One' has claimed two trophies while his opposite number is still waiting for his first. Mourinho won the League Cup and the Europa League (a convenient safety net to secure Champions League football after a disappointing sixth-place Premier League finish) last season and is a manager who consistently deals in the currency of trophies. The problem Mourinho faces now is a Manchester City who are increasingly in Guardiola's own image and likeness with the financial power to ecplise any spending plans Manchester United may have. Mourinho, for all he may rail against it, may be finding himself in a fight he cannot win. So how will the battle continue? Mourinho will continue to seek advantage, to probe any perceived weaknesses in Manchester City's make-up but with every passing victory this looks an increasingly forlorn task. City's superiority over Manchester United came at the point when frailties were being discussed - wins against Huddersfield Town, Southampton and West Ham United that only came via very late goals, the absence of injured and influential John Stones, the possibility of a vulnerable central defence containing Nicolas Otamendi, and Vincent Kompany carrying an injury. United were unable to take advantage - but there is still plenty for Mourinho to set his sights on. Mourinho loves the twists and turns of the Champions League, having won it twice - with Porto and Inter Milan - and United qualified for the knockout phase impressively. They will find out their last-16 opponents in Monday's draw. And there are still domestic cup competitions to fight for. This was, however, a pivotal Premier League day, a chance for either Mourinho or Guardiola to make a serious statement of intent. In the final reckoning, Guardiola's team spoke far more eloquently than Mourinho's - and there can be no doubt the Catalan comfortably holds the balance of power in Manchester.